We have been working hard with Ric from CNQG (and Helen from Blackshadow) to provide you with a BLF Edition of the Starry Light SA-22: A non-expensive, bright 4xAA light. SA-22 has it's flaws, but we decided to make it better. Manufacturer is currently making the first sample according to our specs, and I'd like to announce the GB already now. The sample will be tested & reviewed before the GB starts. Disclaimer: If anything goes wrong, this GB might be delayed or canceled. 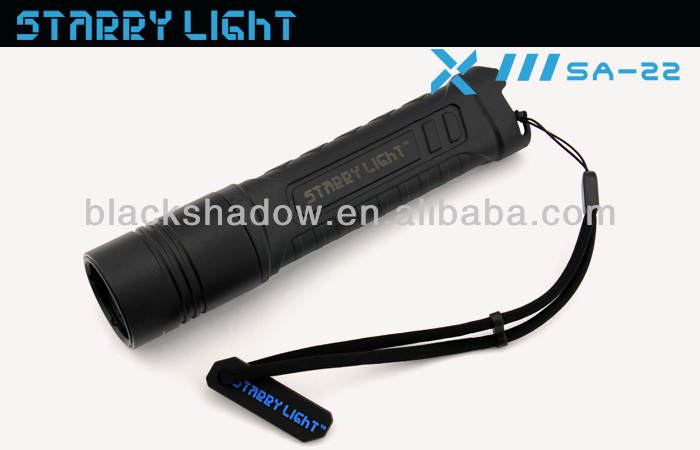 - 4 modes, LL-L-M-H (0.2%, 2%, 25%, 100%), with memory, no blinky modes! Lights are now in production, GB starts! Estimated manufacturing time is about one week. Note: The light is sold only to BLF members until the GB ends. Please include your BLF user name to the message field on checkout (Other info / Order postscript). Both NW (XM-L2 T6 3C, up to 200pcs) and CW (XM-L2 U2 1A, up to 100pcs) are available. GB lasts until March 15th. The remaining ones (if any) after the GB will be sold for about $30 "for anyone interested", meaning also non-BLF members. Update 2014/03/24: GB closed, some lights still available for $23/24 + shipping. I'm in , if the head - body tube fitment issue can be resolved .. Many times I have wanted to help someone get a quality light but did not want to burden them with lithium-ion batteries and chargers . Some people are better off with plain old off-the-shelf alkalines . Thanks for all of your efforts , _the_ . Would NO memory be a better choice, given the alkalines and the potential of giving these to non-flashlight people? IMHO, no. We thought about this and decided to go with memory. No memory with low low is good for a small keychain light, but this will be used on low or med most of the time => working (<2s off) memory is the way to go. I am in for one for sure! count me in for 1 sir. In for at least 2! I’m in , if the head – body tube fitment issue can be resolved .. Thanks for all of your efforts , the . You may be breaking Bort’s light fast, can you do a automatic turbo stepdown option (maybe a solderable star) to prevent overheating for non flashaholics, or a thermal sensor with automated power reduction? Some questions, can the LED be replaced (sinkpad/noctigon) by me or be purchasable with it? Will it have a linear or buck driver? Will the body be plastic or metal? Will it have polarity protection? I am interested. Tentative Yes. Interested if it passes the proper testing for issues others have been having with them.i.e. head fitment of threads. I'd be in for .. 5 pieces. If the reviews show that the thread issue has been resolved. I’n in for 1 as long as thread issue fixed and review is acceptable. I’m interested but I need to see your review first. I have been looking for good AA light for my dad. Just hope I don’t miss it again when it really starts. i wanne 1 ! but it must good works! but we want the full BLF logo with ..where Frugal meets with Flashlight….. In for 1 depending whether fitment issues resolved. I’d be in for 1 or 2 if they review out well. The head threading sounded like a bit of a problem. I am in if It has hidden strobe. Mother inlaw torch. Needs to not have problems with the head. Otherwise I will have problems with my head hearing all the nagging. Id be in for one if the review is good. Id like to be in for one. Is there a review or tear-down of this light? Is the body metal or plastic etc? And sorry to be a noob but is PWM bad? All my AA lights (I only have AA or AAA) say no-PWM. But yeah 22$ shipped is a great price I can do that for sure if its a quality light! Thanks for organizing. Please PM me so I dont miss this!